That said, I believe — and at Facebook we believe — that degrees are always secondary to skills. 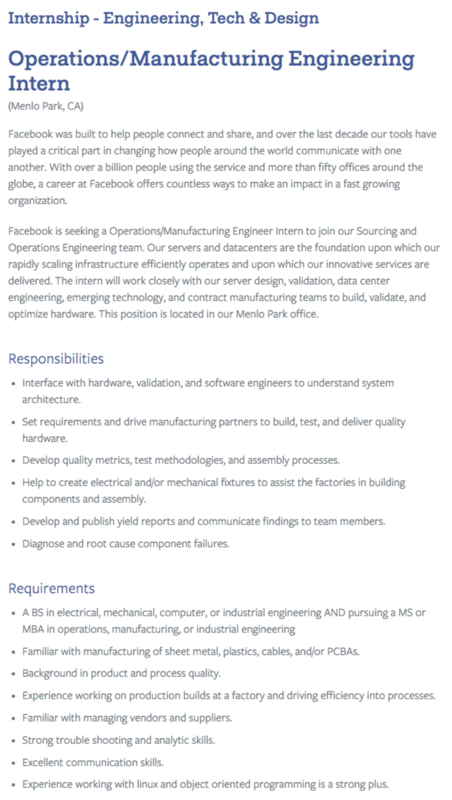 In hiring at Facebook we care what people can build and do. While I got great value from my experience, MBAs are not necessary at Facebook and I don’t believe they are important for working in the tech industry. That’s Sheryl Sandberg’s view but is that reflective of how hiring managers in Silicon Valley view MBAs? If hiring managers don’t believe in the value of an MBA, there wouldn’t be any point in stating it as a criteria for selection on job postings, would there? We analyzed over 50,000 job listings by major technology companies, and another 50,000 job listings at major companies outside of tech. It appears that the hiring managers at Facebook and other Silicon Valley companies didn’t get Sheryl’s memo. In absolute terms, Facebook has a large number of job listings that prefer, or strongly prefer an MBA, including internships specifically for current MBA students. In fact, they are currently looking to fill 75 positions, or 9% of their total openings with a preference for an MBA. We decided to see how Facebook and other tech companies preferences for MBAs stacked up against Wall Street behemoths like Goldman Sachs. What can be more friendly to MBAs than Wall Street? 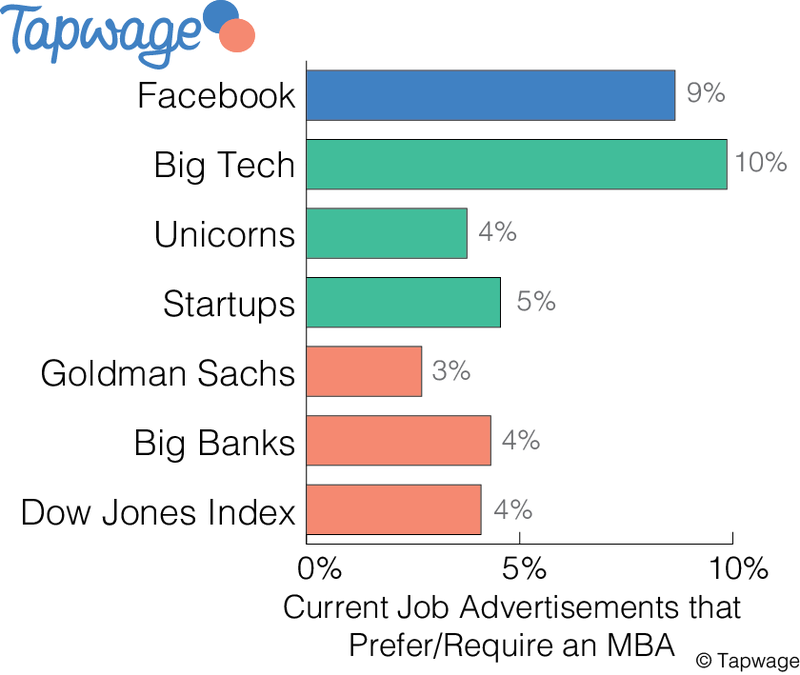 As it turns out, Facebook looks for more MBAs than Goldman Sachs. In fact 3x as many job postings by Facebook state a preference (and sometimes a “strong preference”) for an MBA compared to Goldman, both in absolute number of jobs, and in the jobs as calculated as a percentage of their total job listings. Facebook isn’t alone in it’s preference for MBAs. Google, Amazon and Apple all have a significant number of job listings that require or prefer an MBA. And when you look at a broader group of 40 large publicly traded technology companies, the percentage of MBAs in demand is double that of even the major Wall Street banks. In absolute terms, large technology companies have 3,000 open job postings indicating a preference for MBAs compared to only 900 jobs at the 8 largest Wall Street banks. 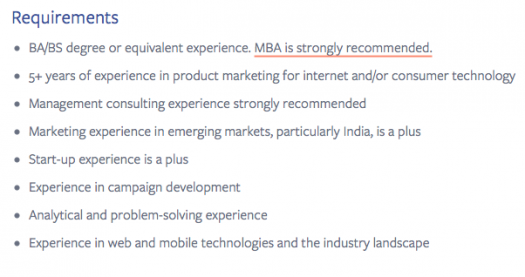 To be fair, most jobs that reference an MBA indicate it as a preference or a plus. That is the case across industries as most companies recognize that candidates can substitute an MBA with on-the-job experience. However, a preference for the degree featured prominently in these Silicon Valley job postings, and often was even required or strongly recommended. 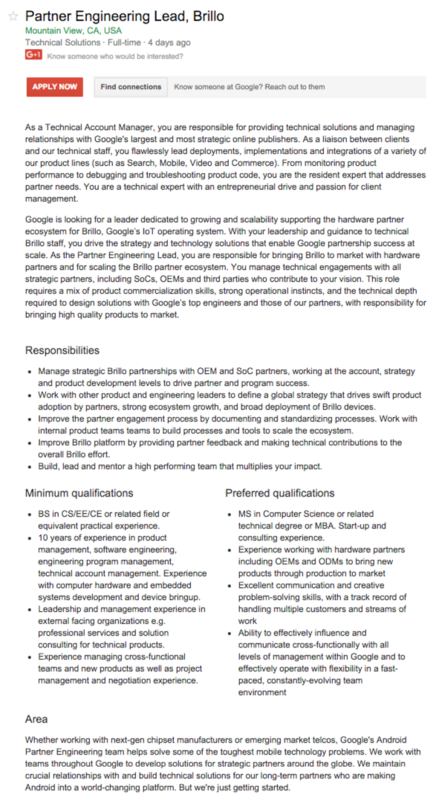 Moreover, Facebook and other technology companies have sizable MBA intern classes from leading business schools and advertise for MBA specific jobs like this one from Google for MBA Interns (screenshot) and this job from Facebook for a Risk and Payments MBA Intern (screenshot). So what do these MBA jobs look like? The jobs that require an MBA span a wide range of functions. 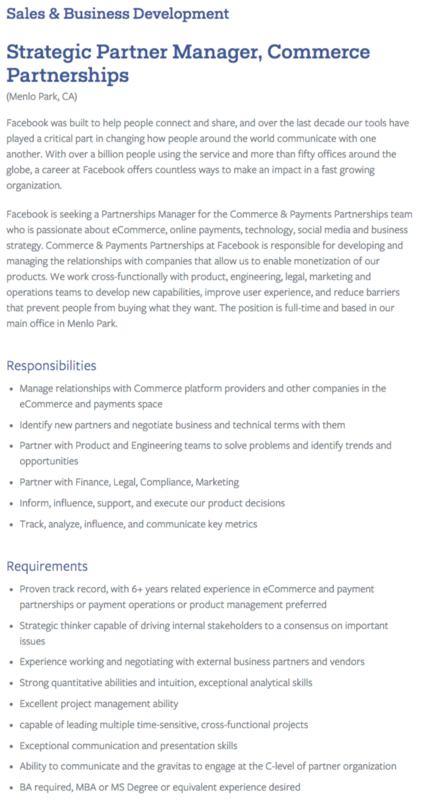 At Facebook, they range across roles in finance like this one for a Finance Manager — Global Marketing Solutions (screenshot), roles in strategy like this one for Strategic Partner Manager, Commerce Partnerships (screenshot), and roles in product management and marketing like this listing for a Consumer Product Marketing Manager, Protect & Care (screenshot). They also include MBA internships where an MBA is explicitly required like this posting for an Operations /Manufacturing Engineering Intern (screenshot). 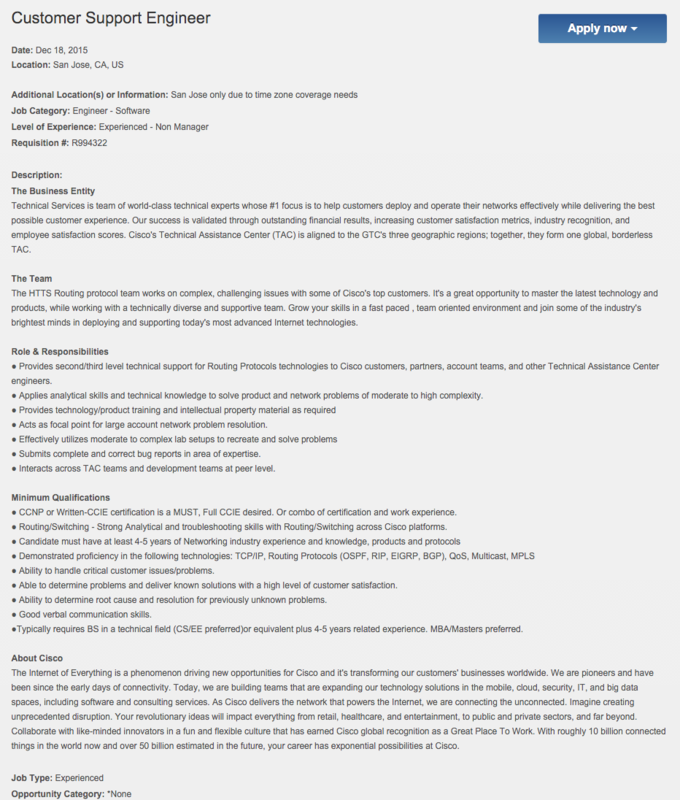 Similarly, at other large technology companies, MBA preferences span a wide range of job titles and departments ranging from product management, strategy and finance, but also include technology focused titles like a Customer Support Engineer job at Cisco (screenshot) , or a Program Manager job at Microsoft (screenshot), or an Engineering Lead role at Google (screenshot). Startups are no exception to this demand for MBAs despite public proclamations from venture capitalists like Peter Thiel. Analyzing 6,500 open job postings at Unicorns, we found over 250 jobs (~4%) that required or preferred an MBA. 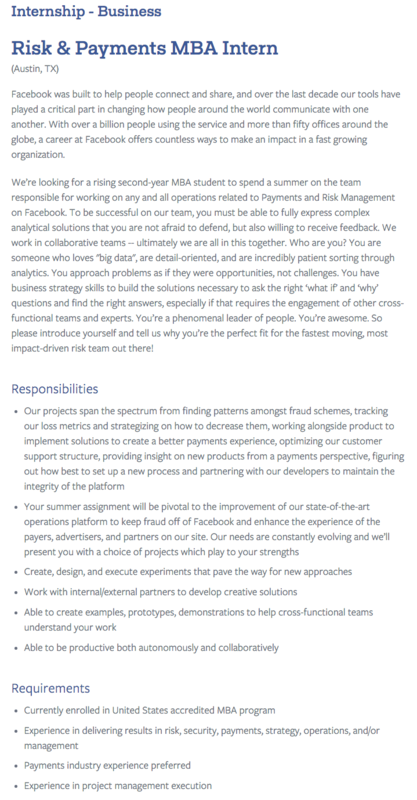 These jobs were primarily in business development, finance or product management but also included the occasional sales engineering job like this role for a Senior Sales Engineer at Okta (screenshot) where an MBA is preferred. Even looking at job listings from startups that haven’t yet reached the hallowed ‘Unicorn’ status showed a meaningful demand for MBAs. Out of over 17,000 jobs analyzed, we found nearly 800 jobs that required or preferred an MBA. 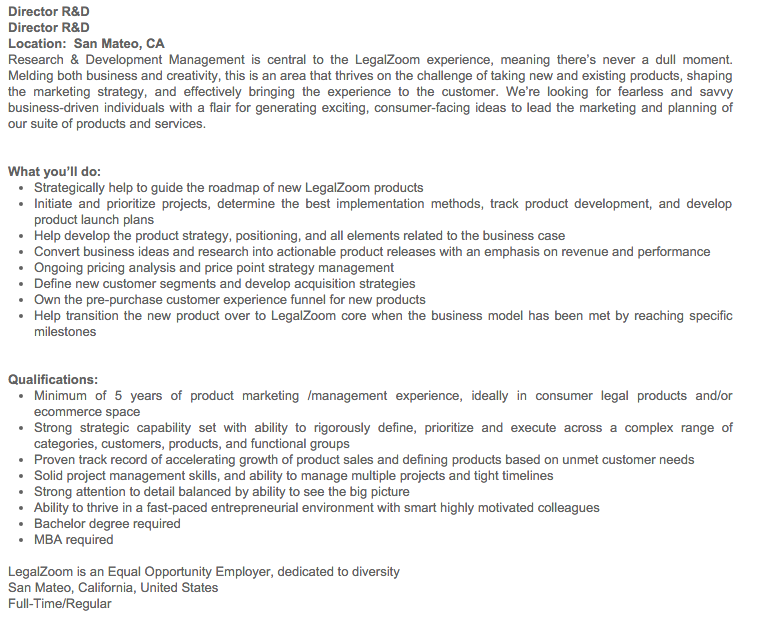 At these companies, barring a few MBA internship roles offered, jobs for MBAs tended to be more senior positions that required close to 10 years of experience like this job for Director of R&D at LegalZoom (screenshot) where an MBA is required. So which tech company seems to want MBAs the most? Amazon. It had over 1000 jobs that listed a preference for an MBA, which was nearly 20% of all their current job postings. The big four companies in tech — Apple, Google, Amazon and Facebook, are looking for an MBA in 16% of their current job listings — a whopping 1,700 jobs. So if you have an MBA, don’t hide it away just yet. Hiring managers still value the degree even if Sheryl Sandberg disagrees. If you have a minute, check out Tapwage. We curate jobs from great companies specifically for MBAs, engineers and working professionals. Use Tapwage to not only search for a job, but to discover a career that matches your unique skills and interests.